MATERIAL COLOR: This fabric is available in white only. PROOF: Upon receipt of your complete order we will provide a black and white artwork proof with layout/imprint choices, should you wish to modify the design, we'll work with you and provide a complimentary reproof. NOTE: As we are the manufacturer of this product - we can gladly work with you to design a more elaborate design. 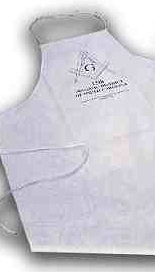 Bib of apron imprinted centered left/right unless otherwise specified, printed on hand gig, location of imprint on the neck hole in relation to the neck hole may vary. As always, a sample random imprinted bib is available for inspection prior to final sale purchase of your custom created order. Any concerns must be addressed prior to final sale purchase. Ink color matching will always be "as close as possible" due to material properties. We do not represent true colors online in photos or print outs. Pantone numbers are listed as approximates. Approximate 10 Day Production Time + Ship Time is the total time to receive your order. Add ship time from New Jersey and order expedited shipping as necessary. 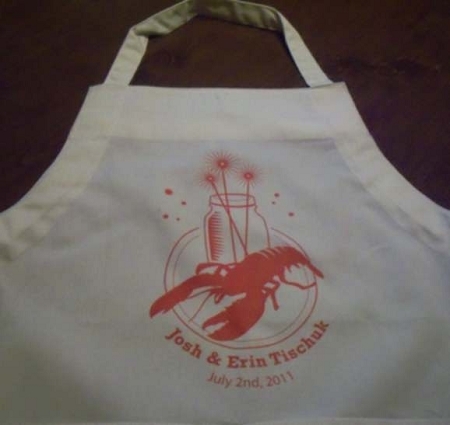 ADD ON AS FEW AS ONE to your order as a keepsake or as server aprons to coordinate with your bibs!